Happy Friday! Here's a new tutorial for you. A few of you mentioned that you'd like learn how to make my Summer and the City dress, so I figured out a way to show you how to draft the bodice yourself. If you do want to make this but don't have time now, you can find it later in the "Make This" section on my blog. Part 2: Drawing in the neckline and shoulder cap, and repeating for the bodice back. Here we go with Part 1. 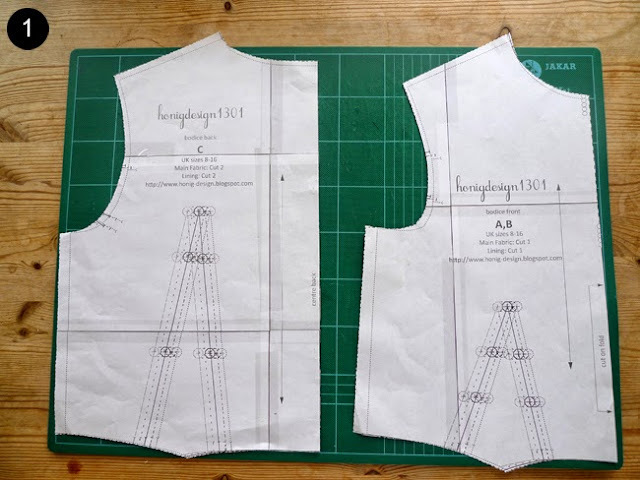 Our base pattern has a waist dart, but we want a bodice with a bust dart at the side seam. Here's how to move it over, and make a couple more adjustments along the way. 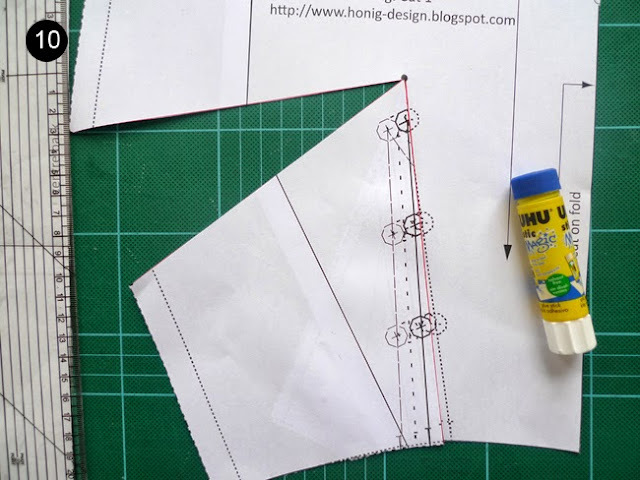 1) Print out the base pattern and cut your size. Refer to the size chart below. I'm working on a size 10. Here's a quick cheat sheet on some of the terminology used below. 3) Placing a ruler on that line, measure 2cm up from the tip of the dart. 4) Mark this point. This is the actual bustpoint for the bodice pattern and referred to from here on as the dart apex. 5) Draw the new waist dart, joining the apex of the dart to the bottom of the dart legs for your size. 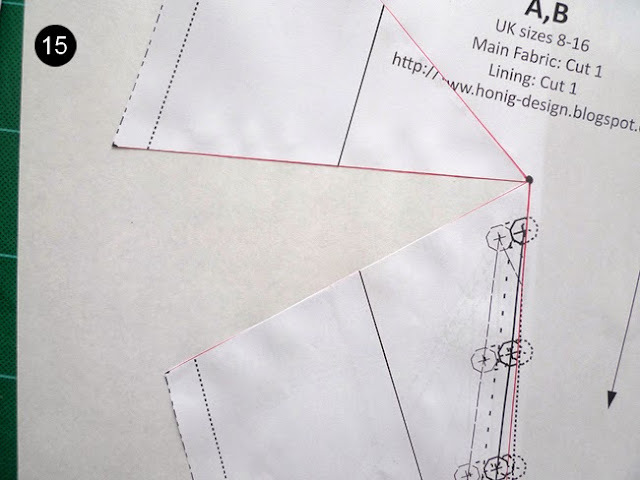 6) At the bodice side seam, measure 10 cm down from the arm scye and mark. 8) Using scissors, cut or "slash" the left leg of the waist dart to - but not through - the dart apex. 9) Now do the same along the newly drawn line from the side seam to the dart apex: slash to but but not through the apex. 10) Now you have a moveable lower left corner of the bodice. Close the waist dart by moving the left leg of the waist dart to the right leg and glue or tape securely. This will open up the bust dart. 11) On the pattern you've downloaded, you'll notice some small circles on the arm scye. These represent the arm scye dart. (I am working from a different print out and have marked these points with my pencil above.) Draw a line from the two circles on the arm scye on your size to the dart apex. You now have a very wide bust dart on the side seam, and you've closed the waist dart and the arm scye dart. 15) Glue or tape the new bust dart onto a piece of paper. 16) Now we want the bottom leg to meet the top leg of the bust dart. Make a clean fold along the lower dart leg to the dart apex, as best as possible. Press down along the side seam so that the layers of paper are neatly folded, and the lower and upper dart legs meet each other neatly. 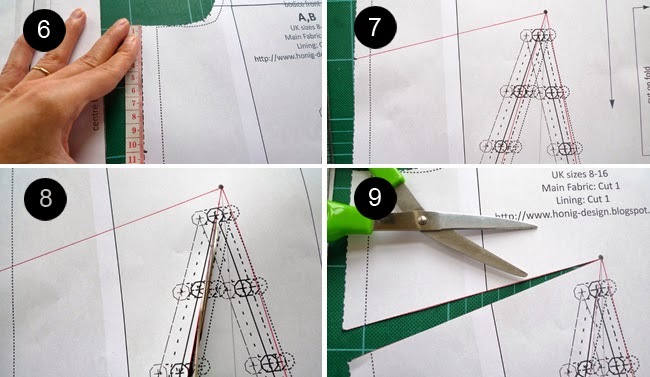 Using a tracing wheel or something pointy (I'm using my pivot tool) punch through the three layers of paper lightly, along the side seam line. 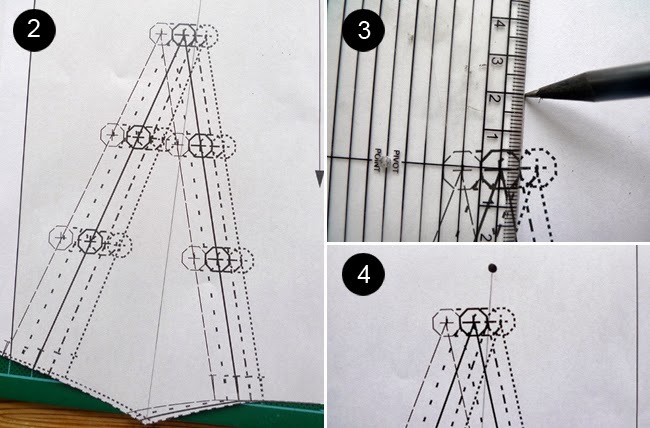 17) Connnect the punched dots with a pencil. 18) Trim away the excess paper. 19) Draw a line through the centre of the bust dart to the apex. Mark a notch 2cm down that line, to the left of the apex. This is the new bust dart point. 20) Draw in the legs of the bust dart by connecting the new bust dart point to the end of the original dart legs. 21) Measure in one centimetre from the centre front at the neckline and mark. 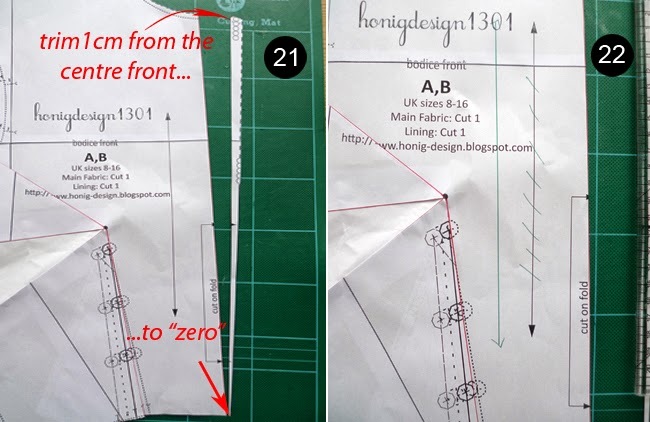 Draw a long line from this point down the front of the to where the centre front meets the waist, or "zero". Trim along this line. 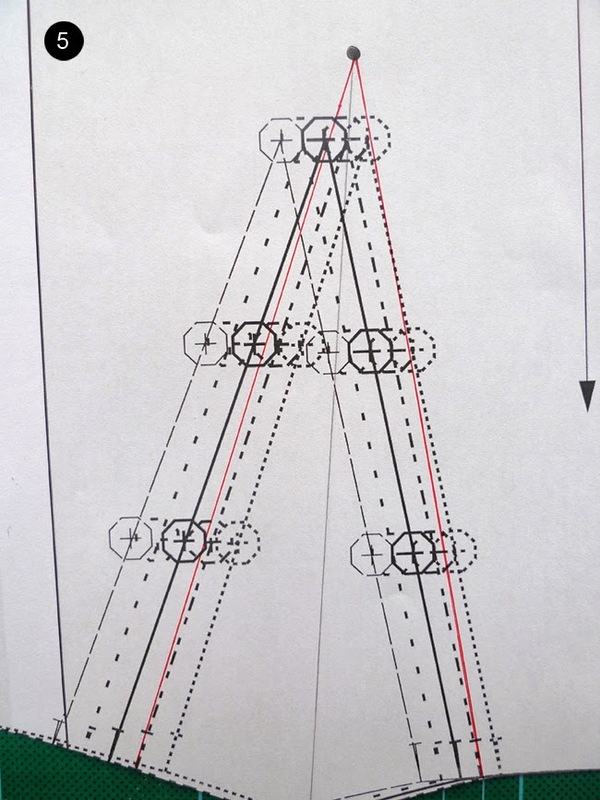 22) Draw in a new grainline parallel to the centre front. We're nearly there - we've moved the waist dart, adjusted for the sleeveless bodice and lower neckline. 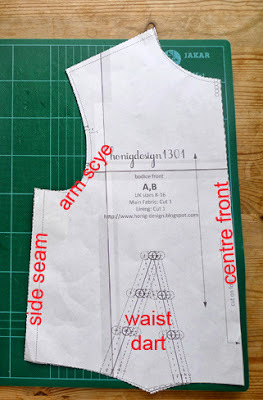 Click here for Part 2 - How to draw in the neckline and the cap sleeve, and how to repeat this on the bodice back. You're welcome! I hope you have fun making it! Whoohoo thank you! Will have to make this one! Great to hear Nat, I hope you like! The dress is so cute, what fabric did you use? WOW thank you! 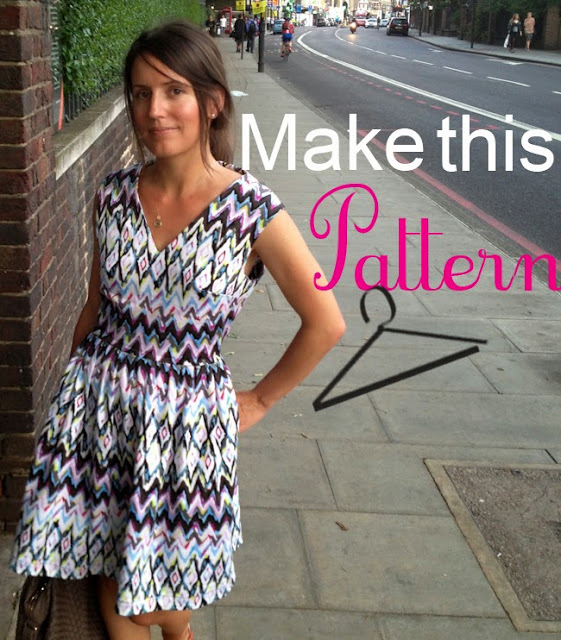 I have downloaded the pattern, now I have to find time to make the changes! ha, ha, ha! Im trying to download the pattern but do not work. Have you another link? Thank you very much! Hi Debbie, have you tried clearing the cookies on your computer? Or downloading Google Chrome? If neither of these helps drop me an email and ill forward it to you. Perfect dress! Fabric is so beautiful!